We rely on our vehicles everyday and, whether we think about it or not, our car gauges play an important role. GM Gauge Repair provides a specific gauge service for specific chevy vehicle year models. During 2002-2006, Chevy models were created with a fault in the gauge. Todd, owner of GM Gauge Repair, is one of the leading specialists in this market and can have a gauge fixed within 24-48 hours of receiving the parts. 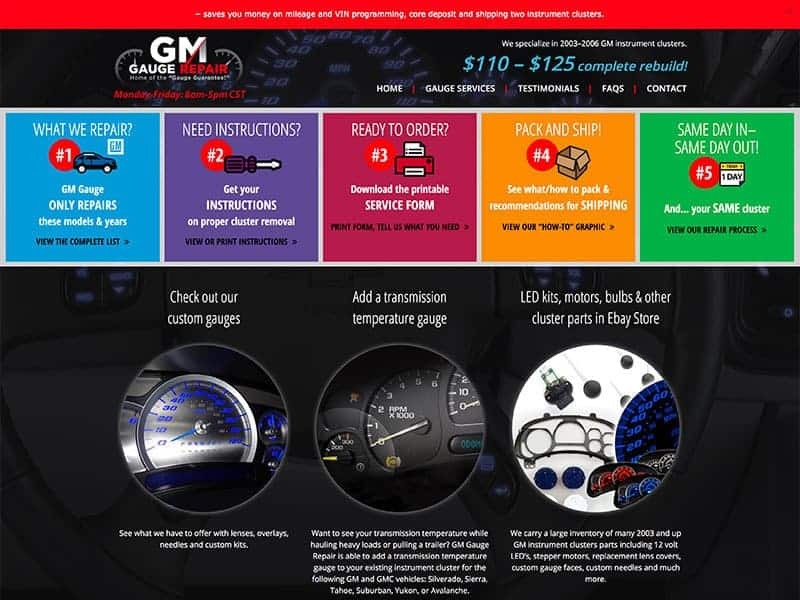 The company provides quality service and with numerous testimonials on their site, it is easy to see why so many people choose GM Gauge Repair! Vision Design worked with Todd to help create and update his branding for a stunning new website. On his home page, you will find easy to follow steps for GM repairs that our team created for simple use. Todd wanted to give customers the initiative needed to research if their cars were the right year and model. To help, we created a well-defined list of vehicle models for customers to view. GM Gauge Repair is a great example of how SEO keywords and Pay-Per-Click (PPC) advertising can benefit a business. By incorporating proper keywords into the website, GM Gauge Repairs appears first on many search engines when researching the services and products Todd provides. GM Gauge Repair uses PPC as their only means of advertising, and have seen tremendous results. Pay-Per-Click is a great way to generate new business. Contact us to learn more!